I love holiday food. Celebrations by definition bring out the best food. Especially during these times of self denial in the name of good health. With fats now being considered absolutely sinful how can you not embrace a holiday that exhorts you to fry all of your food in fat. Maybe not all of your food, but as much of it as possible and as in deep a fat as possible. So in honour of Hanukkah and the miracle of the oil I made latkes today. 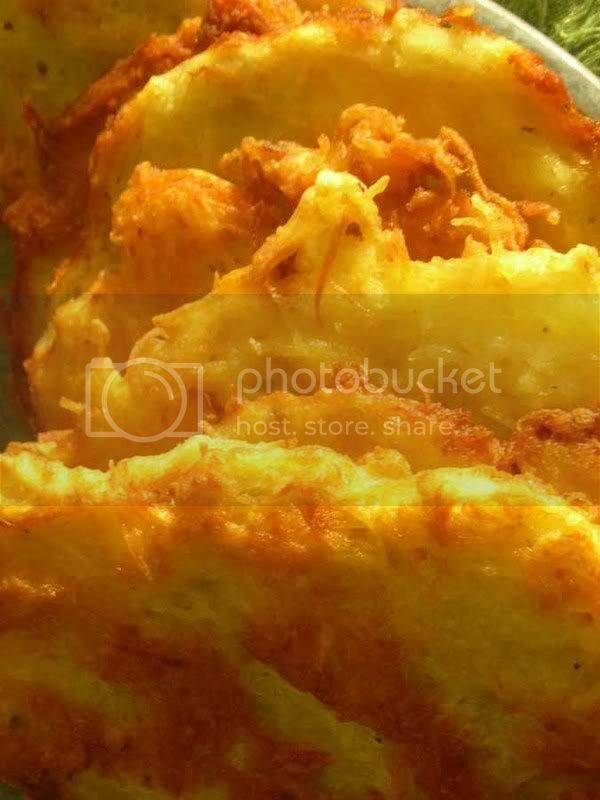 As well as commemorating a miracle latke's also remind me of good times with my mother-in-law (MIL). My MIL speaks only a few words of English and I speak only a few words of Polish, but we both enjoy sporadic outbursts of cooking, particularily for celebrations. My husband has fond memories of his mother's latkes and detests most commercial latkes and their resemblance to hockey pucks. He criticized my first attempts at latke making as too coarse. My recipe only instructed me to peel, grate and drain the potatoes. My MIL made latkes for us during her first visit, and I watched closely. She hand grated the potatoes on the smallest holes. Then she drained the grated potatoes through a tea towel and squeezed out as much liquid as possible. I have yet to read a latke recipe instructing to squeeze finely grated potatoes in a tea towel, yet this appears to be a most essential step that ensures minimal separation of the batter. I rarely hand grate my potatoes, as I fear shredding my nails and fingertips. For years I processed the potatoes with short pulses in the food processor, but this leads to a lengthy appliance cleanup. Last year I bought a mandolin. I can't explain why but it is easier to clean than a food processor and although it is not an electric appliance it is much more efficient than a hand grater. So today for the first time I grated my latke potatoes on the mandolin. It worked like a charm. Above is a photo of the golden finished product. Pass the sour cream --yes even more fat. The righteous can have applesauce. posted by Scheherazaad @ 12/08/2007 05:09:00 p.m.
Mmmmmm... Latkes... Yummy. I'm going to have some of those this week. Happy Hanukkah! happy holidays & hope your break is kickass!